Chip Kelly’s offensive success hinges on his ability to establish the running game. It made sense, then, for him to bolster the trenches with his first-ever (and hopefully highest-ever) draft pick. In 2012, an avalanche of injuries along the front five derailed the Eagles’ season. In 2013, the Eagles return Jason Peters, Todd Herremans, and Jason Kelce. Thankfully, Kelly won’t have too much rebuilding to do since the Eagles’ existing offensive tackles fit the mold of an Oregon offensive lineman. In Philadelphia, expect tackles to be tall, athletic, in shape, and nasty. It’s risky to only keep three tackles on the final roster, but keep in mind that I’m classifying Todd Herremans as a guard, and he can start at tackle in a pinch. That gives the Eagles three tackles with starting experience and a rookie who was drafted in the top 5. Johnson and Peters are absolute locks, and it’s pretty hard to imagine a camp body like Matt Kopa or Allen Barbre beating out Kelly for swing tackle duties. There isn’t much doubt that Peters and Johnson will be the bookend tackles against Washington. Peters appears to be completely recovered from the Achilles’ tear that cost him the 2012 season and Johnson is already taking reps on the right side. The Eagles have the potential to trot out two dominant tackles, but both Peters and Johnson have some question marks. Peters was the best offensive lineman in the league in 2011, but there’s no guarantee that he returns to form after suffering a devastating injury a year ago. Still, his recovery is going smoothly by all accounts and he seems to be at 100% or very close to it. Johnson has immense talent, but he has never taken an NFL snap and Chip Kelly described him as “raw.” He’s got world-class athleticism, but he hasn’t played on the offensive line for very long and could stand to get stronger. Despite the questions that Peters and Johnson still must answer, it’s hard not to be optimistic about this group. 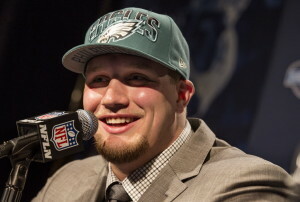 The Eagles boast two of the most athletic tackles in the league, one of whom is a perennial all-pro and the other was hand-picked by Chip Kelly. The depth is also solid, as Todd Herremans is a legitimate starting right tackle and Dennis Kelly didn’t embarrass himself as a rookie starter in 2012.